It was never going to get them knighted by Her Maj, but the Manic Street Preachers's agitprop polemic certainly got them noticed..."Repeat after me," implored white Levi's-wearing front man James Eastwood Bradfield on Repeat (Stars and Stripes) from his band's incendiary debut double-album Generation Terrorists in 1992: "F**k queen and country/ Repeat after me/Death sentence heritage/Repeat after me/Death camp palace..." Ohh, mummy, tell the angry men to go away. 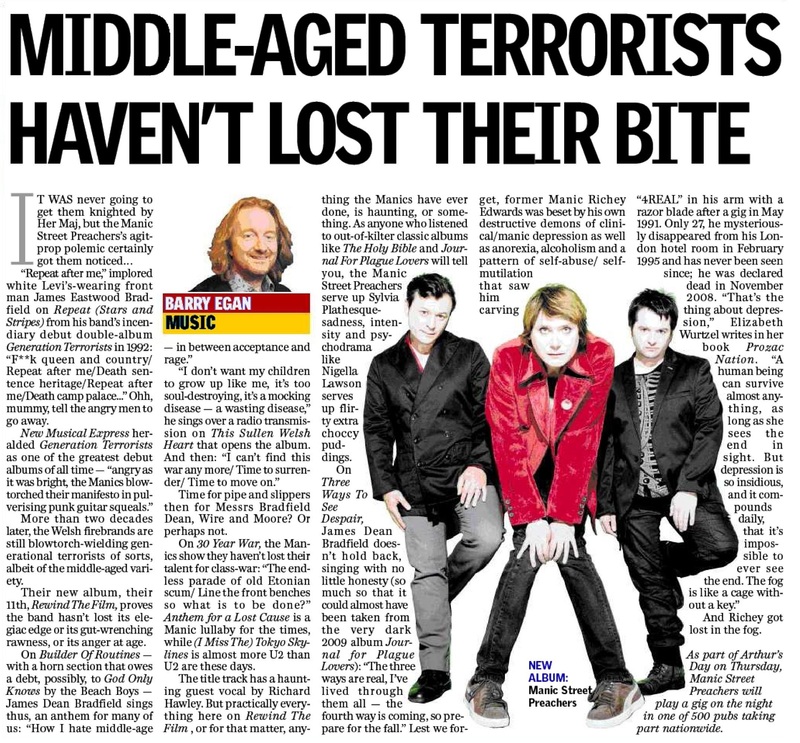 New Musical Express heralded Generation Terrorists as one of the greatest debut albums of all time - "angry as it was bright, the Manics blowtorched their manifesto in pulverising punk guitar squeals." More than two decades later, the Welsh firebrands are still blowtorch-wielding generational terrorists of sorts, albeit of the middle-aged variety. Their new album, their 11th, Rewind The Film, proves the band hasn't lost its elegiac edge or its gut-wrenching rawness, or its anger at age. On Builder Of Routines - with a horn section that owes a debt, possibly, to God Only Knows by the Beach Boys - James Dean Bradfield sings thus, an anthem for many of us: "How I hate middle-age - in between acceptance and rage." "I don't want my children to grow up like me, it's too soul-destroying, it's a mocking disease - a wasting disease," he sings over a radio transmission on This Sullen Welsh Heart that opens the album. And then: "I can't find this war any more/ Time to surrender/ Time to move on." Time for pipe and slippers then for Messrs Bradfield Dean, Wire and Moore? Or perhaps not. On 30 Year War, the Manics show they haven't lost their talent for class-war: "The endless parade of old Etonian scum/ Line the front benches so what is to be done?" Anthem for a Lost Cause is a Manic lullaby for the times, while (I Miss The) Tokyo Skylines is almost more U2 than U2 are these days. The title track has a haunting guest vocal by Richard Hawley. But practically everything here on Rewind The Film , or for that matter, anything the Manics have ever done, is haunting, or something. As anyone who listened to out-of-kilter classic albums like The Holy Bible and Journal For Plague Lovers will tell you, the Manic Street Preachers serve up Sylvia Plathesquesadness, intensity and psychodrama like Nigella Lawson serves up flirty extra choccy puddings. On Three Ways To See Despair, James Dean Bradfield doesn't hold back, singing with no little honesty (so much so that it could almost have been taken from the very dark 2009 album Journal for Plague Lovers): "The three ways are real, I've lived through them all - the fourth way is coming, so prepare for the fall." Lest we forget, former Manic Richey Edwards was beset by his own destructive demons of clinical/manic depression as well as anorexia, alcoholism and a pattern of self-abuse/ selfmutilation that saw him carving "4REAL" in his arm with a razor blade after a gig in May 1991. Only 27, he mysteriously disappeared from his London hotel room in February 1995 and has never been seen since; he was declared dead in November 2008. "That's the thing about depression," Elizabeth Wurtzel writes in her book Prozac Nation. "A human being can survive almost anything, as long as she sees the end in sight. But depression is so insidious, and it compounds daily, that it's impossible to ever see the end. The fog is like a cage without a key." And Richey got lost in the fog. As part of Arthur's Day on Thursday, Manic Street Preachers will play a gig on the night in one of 500 pubs taking part nationwide. This page was last modified on 30 October 2018, at 18:47.